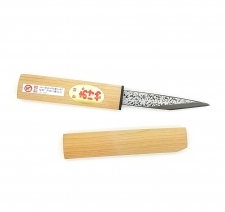 Laminated steel yocote marking knife. Japanese Yokote Marking KnifeNot to be confused with other cheaper knives on the market our Japanese Yokote marking knife is of the finest quality, the laminated blade is hammer tone finished on the face and flat ground on the back side to register true against a marking gauge, the back side of the business end also has a slight hollow grind for ease of lapping the back of the blade. The cutting edge comes to a very fine point and is double bevelled then polished to produce the legendary level of sharpness you expect from a Japanese edge tool. The wooden handle proves very comfortable in use and the sheaf protect the blade when not in use.